Sunrise Acres is a Family Egg Farm located in Hudsonville, Michigan. Sunrise Acres was started by Marvin and June Patmos with 100 chickens in 1949. Marv’s two sons took over day to day operations in the 1980′s. Today the third generation of our family is learning the family farm business. We are proud to support our local farmers by buying their grain and we always buy “Michigan First!” with all of our supplies and needs. 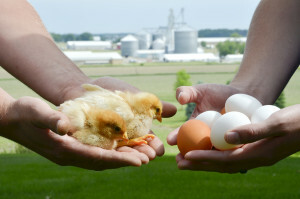 We participate in the United Egg Producers Animal Welfare Program. We have all been taught by our parents to take care of our animals as we were growing up. Our farms have full HACCP & SQF programs for food safety and we voluntary participate in the Michigan Agriculture Environmental Assurance Program. We are proud to be a Michigan Farm Family that produces a wholesome farm food for the People of Michigan and the USA to enjoy. Hens with white feathers produce white shelled eggs. Hens with red or brown feathers produce brown shelled eggs.